Was there a food that you ate often as a kid, that at the time didn't thrill you, but as an adult you have grown to love? Well with me, one of those foods is egg salad. We had it quite often when I was growing up and I didn't really care too much for it. I recently made it and could not believe how much I liked it. Actually, I can't wait to make it again. I lightened up the recipe a bit by eliminating some of the yolks. You really don't miss them at all. I used regular mayo because the reduced-fat just does not compare. To compensate I used only 1/2 the amount and replaced the other 1/2 with yogurt. So not only is this classic dish delicious, now it's healthy too! You're Welcome... No, really. It's my pleasure! Put it on a low-carb bagel and you'll think you're in heaven. In medium bowl, stir together mayonnaise, lemon juice, onion, salt, if desired, and pepper until well blended. Slice one egg and reserve 4 center egg slices for garnish, if desired. Chop remaining eggs. Stir in chopped eggs and celery until evenly coated with dressing. Cover and chill to blend flavors. Garnish with reserved egg slices. Bring your eggs to room temperature before cooking. If the egg has been stored in the refrigerator it can be warmed gently under a flowing hot tap water. By bringing the eggs to room temperature, they're much less likely to crack in the hot water. Also the temperature of the egg at the start of the cooking process will affect the cooking time. An egg that is at room temperature at the start of the cooking process will require about 1 minute less cooking time than eggs taken directly from the refrigerator. Over high heat, bring water JUST to a rapid boil. egg pan tightly with a lid. Set timer for 17 minutes for large eggs or 20 minutes for jumbo eggs. After exactly 17 or 20 minutes (depending on size of your eggs), remove from heat and drain off water from the eggs. Transfer the eggs to the bowl of ice cubes and cold water. Let eggs cool at least 10 minutes in cold water, then drain either store in refrigerator or peel** the eggs. NOTE: Watch the time when cooking the eggs carefully. Overcooking causes a green layer to form around the yolk. This layer is caused by a reaction between the iron in the yolk and the sulfur in the white. Heat speeds up this reaction, so the longer your eggs cook, the greater the chance of discoloration. 2. Tap the top and bottom of the eggs on the counter to crack. 3. Roll the egg with the palm of your hand back and forth on the counter so that it looks like little broken pieces all over the shell. 4. Start peeling from the wide end of the shell and remove the skin all around the egg that holds the shell on the egg. I've never had egg salad. I think I've told you this before, but, my mom never allowed anything with mayonnaise in the house. Or vinegar. 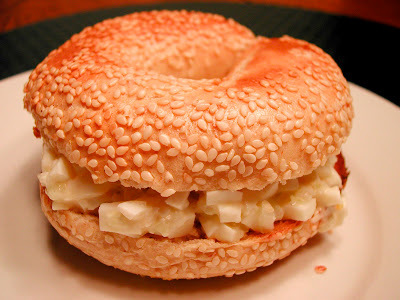 So I have no idea what egg salad tastes like, but yours looks great! 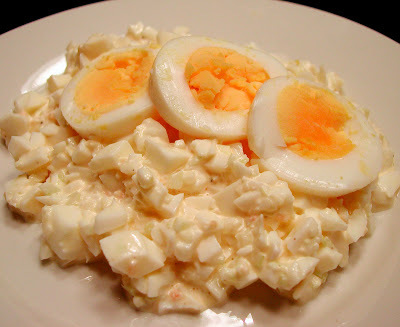 i only learned to like egg salad a couple of years ago. this sounds like a good recipe. Em, That's funny! No mayo or vinegar - I can't imagine. You should try it some day when you are out!! Sara, I guess it is something you have to give a chance to... I'm glad you did!